It's odd the way that the comedy Baby Boom has been forgotten in the three decades since its 1987 debut. I remember sitting down to watch this flick countless times on HBO at an aunt's house, probably even after my folks had rented it on VHS a few months earlier. Yet even I had pretty much forgotten it. None of the jokes or major scenes rang any bells as I just re-watched the new Twilight Time Blu-ray of the film. But one thing had stuck. I was reminded that, even more than her work with Woody Allen (to which I would be exposed later), Baby Boom is the film that made me eternally fond of Diane Keaton as a screen comedienne. As work-obsessed-executive-turned-single-mother J.C. Wiatt, Keaton wrings big laughs out of neurotically bumbling around and expressing her character's insecurity with wild, physical outbursts. But what makes Keaton's work masterful is the way that she just as convincingly shows us J.C.'s alpha-female board-room game face and, alternatively, her warmth and love for the baby that is unceremoniously dropped into her life. This multi-faceted but seemingly effortless performance by Keaton is just one of the aspects that makes Baby Boom (relatively) better than its lackluster reputation. 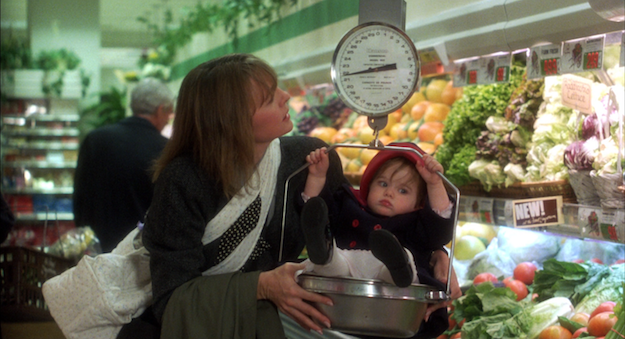 Often pinned as a lightweight yuppie satire with zeitgeist-chasing parenthood themes -- think Working Girl meets Three Men and a Baby -- Baby Boom starts with an appropriately high-concept premise. A tragic car crash puts New York executive J.C. Wiatt in charge of her forgotten cousin's 17-month-old daughter, Elizabeth (Kristina and Michelle Kennedy). Her boyfriend (Harold Ramis) blanches at the idea, and her traditional old boss (Sam Wanamaker) is horrified to think that his would-be partner might give in to her -- gasp! -- biological urges. J.C. seriously considers putting the kid up for adoption, but soon finds the notion impossible to stomach. Her boyfriend leaves her, and she finds herself losing status at her firm but, the movie argues, she becomes a better person in the process. The rhetorical question posed at the start of film is, "Can she have it all?" Can J.C. be a top executive and have a fulfilling family life? In a revelation that will probably come as a shock to no one, the film comes back with a resounding no. Hollywood comedies of the '80s tend to be socially conservative at heart, and Baby Boom, despite its supposedly modern subject matter, often harkens back to even earlier Hollywood comedies, like the fables of Frank Capra and Mr. Blandings Builds His Dream House. This isn't such a surprise coming from the writer-producer-director team of Nancy Meyers and Charles Shyer, who would soon have a sentimental smash on their hands, remaking 1950's Father of the Bride. What is surprising about Baby Boom is that the film arguably doesn't sell out J.C. Wiatt in the name of traditional family values. In its second half, the film offers J.C. an alternative to her high powered executive job. At first, it looks to be a more domestic alternative, with J.C. buying a house in the country to spend time with baby Elizabeth. But soon, J.C.'s business sense has her transforming the fruits and veggies on her property into an artisanal baby food empire. If the film makes J.C.'s rise to the height of the baby food business feel astonishingly fast, it is only the time compression that strains credulity. Of course, a character who had the ambition and focus to rise to the upper reaches of corporate culture can make her own independent business venture a smash. 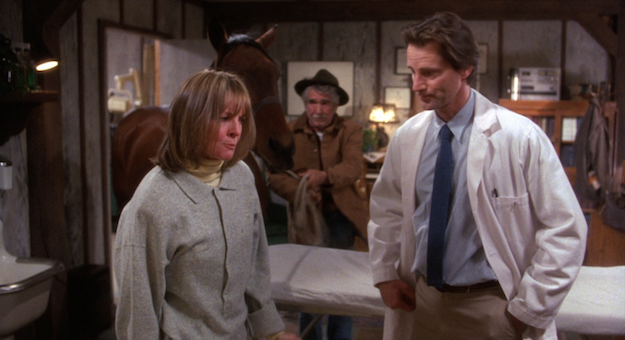 A romantic comedy aspect is introduced nearly two-thirds into the story, with J.C. becoming involuntarily smitten with country veterinarian Jeff Cooper (Sam Shepard). She resists his small-town hunkiness of a certain age. He tries to woo her without trying to woo her, in laidback Sam Shepard fashion. It all ends up pretty much how you'd expect. Except: the film thankfully never turns Dr. Cooper into the missing puzzle piece that completes J.C.'s happiness. By the end, the film makes the convincing case that J.C. is perfectly satisfied, blazing a career trail of her own design and living with the love of her life: the baby. If the film has a glaring flaw, it would be that the baby kind of floats in and out of the film. After the first act, Elizabeth pops up pretty much only when Meyers and Shyer's plot demands her. One of Baby Boom's key strengths is that it gives its characters unexpected roundedness -- even the small parts played by the likes of James Spader (as a yuppie creep, natch) and Pat Hingle. Strangely, it too often relegates Elizabeth, the person who is arguably the flick's co-lead, to the status of a silly or sweet prop. Baby Boom is a smarter and better made comedy than it is usually given credit for, but it is choices like this that cause the film to come up a little short of its potential. Baby Boom is available in a limited edition of 3000 copies. The disc comes with a color booklet, featuring a liner note essay by Twilight Time's Julie Kirgo. This is a solid AVC-encoded 1080p 1.85:1 transfer of a film shot in a fairly dated and not particularly appealing style. Image is typically pretty grainy and soft, although detail reproduction is far, far better than the OOP DVD from MGM. Skin tones look healthy, but the overall palette is mostly corporate blues and grays. The DTS-HD MA 2.0 stereo audio is fine. No major damage or interference, but not a particularly memorable mix either. One subtitle option: English SDH. Audio commentary by Twilight Time's Nick Redman and Julie Kirgo - There's not a lot of history for the TT crew to unpack with this one, so this track has a more conversational, podcast-y vibe than usual. That said, it's actually one of the more entertaining chats I've heard on a TT disc. Music and effects only track - If one aspect of Baby Boom is truly dated, it would have to be Bill Conti's musical score. Please enjoy. 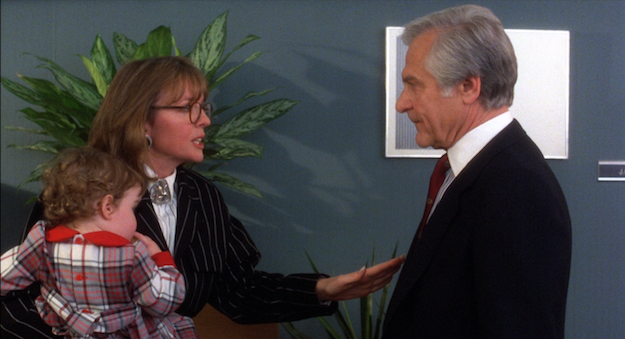 A wonderful showcase for Diane Keaton's comedy chops, Baby Boom is better than you remember. But it's not quite great. Recommended.